The new Hedge EA Advanced has been released. Latest version 1.9c of HEA is in BETA testing mode at the moment, but it already been working without issues for some time. License Key is not required anymore when running EA in the MT4 Strategy Tester. New feature has been added, the CloseBranchOnTP. TakeProfitPips and StopLossPips renamed to HedgeTakeProfitPips and HedgeStopLossPips accordingly. Default values has been changed on some parameters. 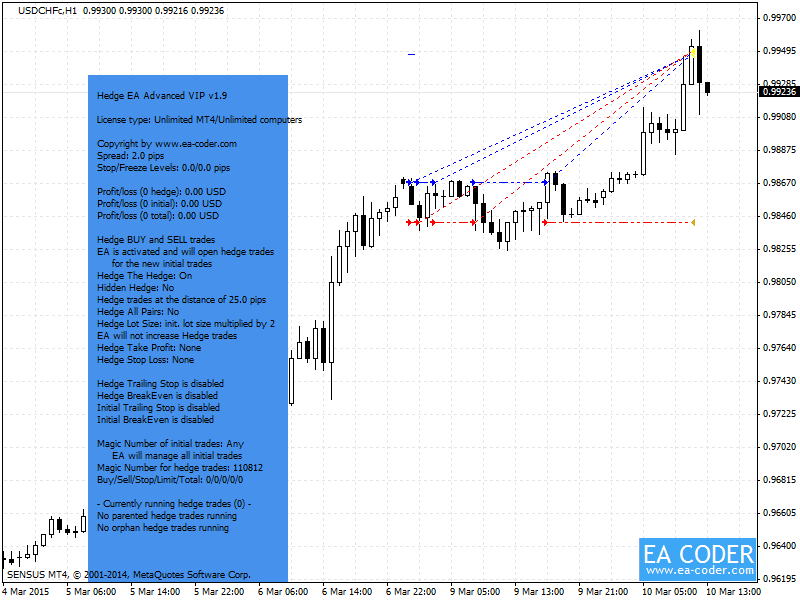 A series of new parameters were added to allow the use of Hedge EA in the MT4 Strategy Tester. You can download the latest Hedge EA Advanced from the Download Center. If you do not remember your password please use your email to reset it from the login page. Latest version v1.9c does not require you to enter the License Key anymore when you are running EA in the MT4 Strategy Tester. Note that this is still required in the v1.9b version that was released couple days ago. Now the most recent version of the Hedge EA Advanced is v1.9c and this one does not need License Key when operating in the Strategy Tester. New feature has been added, the CloseBranchOnTP. By default it is turned on. This feature is very important. Me and all clients of Hedge EA were waiting for this feature for quite a long time. CloseBranchOnTP – this option tells the EA to close all trades of the same branch when one of the trades get closed. This means that even if you have initial trade and many HedgeHedge trades in both directions (buy and sell), which is called a Branch, and at least one of these trades gets closed, then EA will close all of the trades that belong to the same branch. It does not matter if the trade hit TP or hit SL or it will be closed manually or by some 3rd party script, all other trades from the same branch will get closed too. Using this option EA will always close all trades from the same branch which gives you easier hedge trading when you use HedgeHedge option which can lead to a big number of trades. A branch, as you may already understand, is any number of trades that originated from the same initial trade. The branch of trades is also known as “bucket of trades” among Forex trades. TakeProfitPips and StopLossPips renamed to HedgeTakeProfitPips and HedgeStopLossPips accordingly. Both of these options can now be set to -1 (negative one) value. In this case hedge trade will have exactly the same SL/TP size in pips as the initial trade has. If this value is set to zero then there will be no SL/TP set on the hedge trade. EA will leave it unchanged. This means if there is no SL/TP on the hedge trade EA will not add it and if there is any SL/TP set on hedge trade, EA will not change it and leave as is. If this value is set to anything above zero then it will be treated as a size for SL/TP in pips. This means value of 20 would mean to set fixed SL/TP of 20 pips on the hedge trade. UpdateXPipsForExistingHedges is now set to false by default. AlwaysCloseOrphanHedge is now set to true by default. HH_X_Pips is now set to 0.0 by default. This means X_Pips value will be used instead. HH_MaxNumberOfTrades is now set to 5 by default. HH_LimitMode is now set to 0 by default. This means EA will keep opening new HedgeHedge trades until max of HH_MaxNumberOfTrades trades will be reached. A series of new parameters were added to allow the use of Hedge EA in the MT4 Strategy Tester. Those are used only in Strategy Tester and they are ignored in live trading. Below is the list of back-testing settings. Using these options you can set the EA to open an initial trade when back-testing. Please note that you should not consider results and not expect that they will be repeated in live trading. These options should be used only for experimenting and to learn faster what settings you should use with the EA in live trading. Tester_InitialTradeType sets whether to open an initial trade or not and if yes, then in what direction it should be. Bar Time (daily) – opens a trade each day at the specific time set by Test_BarTime option. Bar Time (once) – opens a trade once at the specific time set by Test_BarTime option. Only one initial trade per test is possible with this option. Each Bar – opens a trade on each new price bar. This will create a lot of initial trades. Test_BarTime sets the exact price bar time on which to open an initial trade. This option is used when Tester_OpenTradeOn is set to “Bar Time (daily)” or “Bar Time (once)”. Test_LotSize sets what lot size to use for initial trade. Test_TakeProfitPips sets what take profit size in pips initial trade should have. Test_StopLossPips sets what stop loss size in pips initial trade should have. If you do not have Hedge EA Advanced yet you can start trial or purchase full version here. If you purchase until May 31st 2015 your friend will get one Hedge EA Advanced license too. There’s also a special 50% discount price offer available until May 31st 2015 for those who want to upgrade to a better Hedge EA Advanced license. Contact me if you would like to upgrade to a better license. Just wondering if you can show me some results of hedging EA. Hi, as it is explained on the website, there is no results for Hedge EA because I do not use it myself. After the payment you will receive an email with the download link. If you do not receive it in 15 minutes please check your Spam/Bulk folders. If the email is missing please contact my support team.